Rocky (Rakim Meyers) has a number of notable hip-hop influences, but lyrically this CD reminds me a lot of the first OutKast album, Southernplayalisticadillacmuzik. Immeasurable hype and a great mixtape, LiveLoveA$AP, have lead to A$AP Rocky’s knockout of a major label debut. Lone Live A$AP is as varied as it is thoroughly rewarding, offering up spaced-out beats, dynamite collaborations and A$AP Rocky’s natural, steady flow. The collaborations all seem to work, as Schoolboy Q lights up “PMW” similarly to the pair’s previous collaboration on Schoolboy Q’s awesome “Hands on the Wheel”; Santigold gives “Hell” some dancehall flair; and the likes of Drake, Kendrick Lamar and Pharell don’t steal the show from the center-stage flow of A$AP Rocky on their respective tracks. Producers like Clams Casino, Soufien3000 and Danger Mouse offer up slowed-down, cloud-rap style backdrops for Rocky to swim through with grace, while tracks like “F**kin’ Problems” aim for the gut with hip-hop bravado. 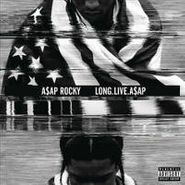 Little on Love Live A$AP sounds tired, as it forges boldly through here-and-now sound, even collaborating with critical pariah Skrillex on the laser-light show of “Wild is the Night.” A$AP Rocky offers little in the way of reverence, allowing his rapping talent and curatorial skills speak themselves. He’s a live wire — long live A$AP.